The 16th century stone-built gate Poarta Ecaterinei or the Catherine’s Gate features a museum and the Coat of Arms at the entrance. It is one of the best-preserved gates built by the Shawns for entering the city. The square-shaped gate has three levels built in Renaissance style. The Jus Galdi privilege that gave the rulers the authority to conduct a death penalty, is symbolized by the four towers on the upper part of the Poarta Ecaterinei. From thematic exhibitions regarding the history of the tower, paintings, pictures, and graphics are featured on various exhibitions in the museum of the gate. Delightful historic monument, commissioned by the merchants of Brasov, surrounded by a serene little pocket park. We took a quick breath here in between tourist activities. Not much to see here but worth a moment of your time to look and reflect. A symbol of the city, worth having a stop and take a look around. Brasov is an amazing place to visit. Romania as a country really stole our hearts, but Brasov has so much charm and the people as so nice. Make this the first place you stay in Romania and you too will be won over. 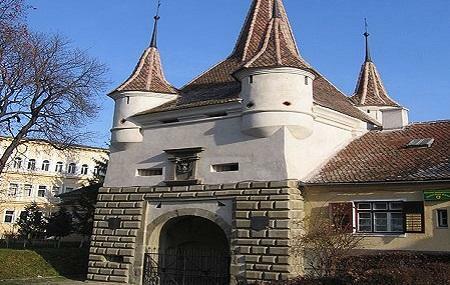 An interesting place to visit and to learn about Brasov 's history.